StartingÂ The CasualÂ Lean’sÂ debut albumÂ is likeÂ opening a floodgate of raw indie-rock passion. As lead singer Justin Oliver’s vocals immediately leap outÂ viciously andÂ almostÂ haphazardly in the opening trackÂ “The Bride,” listeners may not be especially into the eccentric rock style the band offers, but they’ll at least be engaged. Though the album does seem to come out of left field most of the time, it’s not entirely scattershot. In the much quieter, delicate “The Deer,” theÂ band displays their depth withÂ simple music and vocals bleeding into a rather ponderous exploration of freedom and life.Â “You’ll never be as free as anything out here / Cause this is the real America / We are the deer.” Though this song differs from their typicalÂ high-energy presentation, it almost seems to personify the band’s attitude. If nothing else, musical freedom is extensively explored throughout this album. As the songs explode and retract listenersÂ are sure to find things about TheÂ Casual Lean they’re impressed with and things they can do without, but no oneÂ will say they’reÂ simply derivative. 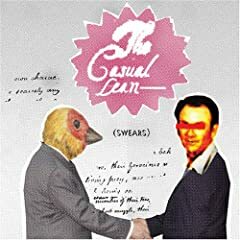 No user commented in " CD Review: The Casual Lean, Swears "